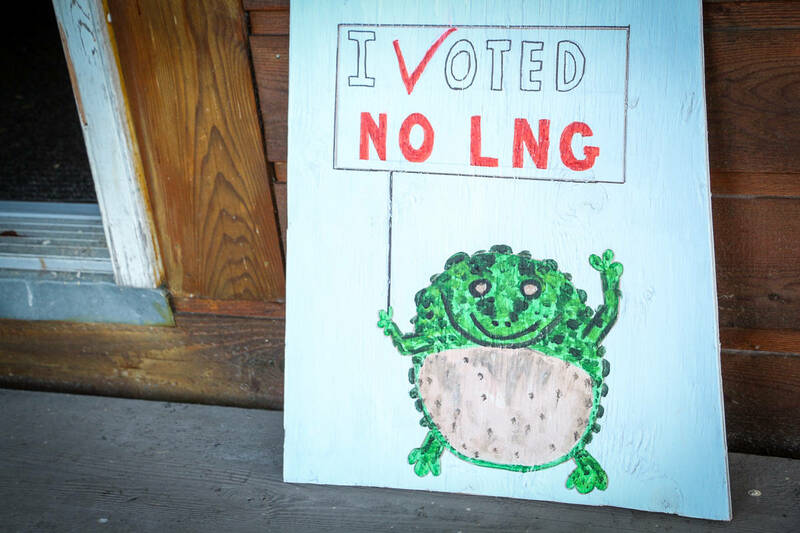 DODGE COVE – Regional politics and environmental inquiries about the liquefied natural gas industry stirred the quiet Dodge Cove community last Friday. It had been three years since the North Coast Regional District (NCRD) meeting was held on Digby Island, June 16, and residents made sure to leave one message with the directors — they need more time to review Nexen Energy’s technical responses to their comments. “It’s fully appropriate for the board to ask for more time. Nexen requested almost two months of extra time in which to respond to public comments,” Des Nobels said, the director representing Electoral Area A — Dodge Cove. The energy giant that is proposing the Aurora LNG project for Delusion Bay is a venture by Nexen Energy, a division of Chinese energy giant China National Offshore Oil Corporation (CNOOC) and Japan’s INPEX Corporation. The company is currently reviewing its project through the B.C. Environmental Assessment Office and after an influx of more than 1,000 comments, Nexen requested more time to respond. Nexen paused the review in March and resumed two and a half months later to be “thorough and diligent in our examination and responses to stakeholder feedback,” spokesperson for Nexen, Kyle Glennie, wrote in an email on June 15. Now that Aurora LNG is back online, the regional district and the working group, which includes representatives from the City of Prince Rupert, First Nations and Dodge Cove, have until June 28 to submit follow up comments. 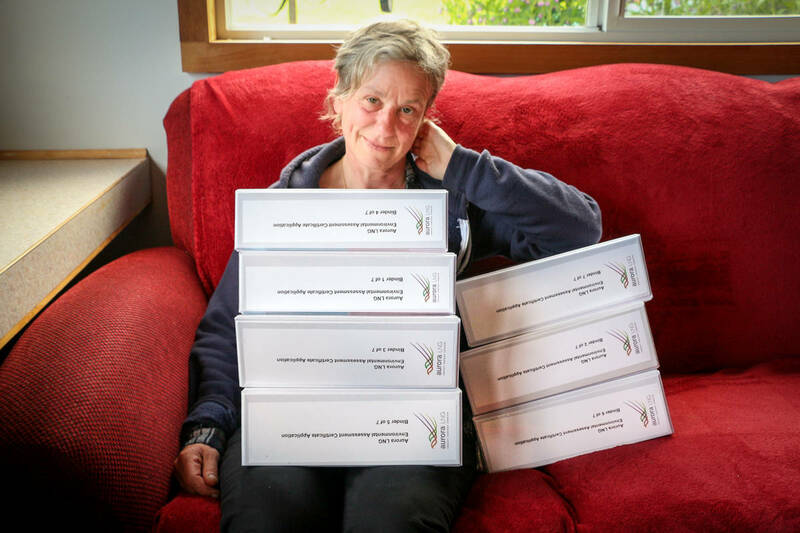 Stacks of binders, maps and articles of information related to the LNG industry were laid out for the NCRD meeting by members of the Dodge Cove community, along with a couple anti-LNG protest signs. “The technical information coming through on these documents is quite substantive and for someone who is not an authority or a professional with regards to this project will find it quite daunting to work their way through the project and try to figure out exactly what is going on,” Nobels said. The regional district’s consultant, Morganne Williams, informed the board that her expertise falls short of some of the technical information related to Nexen’s suggested mitigation measures to avoid polluting the watershed on Digby Island. Williams recommended that the board hire an expert in this area to review information and provide the appropriate comment. The board made a motion to ask for more time to review the company’s responses, and to seek professional advice on the projects impact to the watershed. However, the next NCRD meeting isn’t scheduled until August 18, and director Lee Brain suggested they email the resolution to keep the process rolling. In the public comment period, Luanne Roth, who works with Prince Rupert Environmental Society, T. Buck Environmental Foundation as well as the Dodge Cove Improvement District, raised concerns about Aurora LNG’s air quality measurements for N02 (nitrogen dioxide is the air contaminant associated with smog and acid rain that produces long and short term human health problems). “According to our experts when the proper calculation is done, the air quality will exceed the government objectives to protect human health and that is in Prince Rupert residential areas and in Dodge Cove,” Roth said. The method the company is using to measure air contamination is an old method, and Roth said Nexen is underestimating the percentage of N02 that will come from the project’s turbine stacks. She referred to air pollution engineer, Gordon Esplin’s recommendation that Nexen redo their modelling using corrected inputs and make changes to the project if the results confirm his estimates that the NO2 exceeds government objectives to protect human health. Residents of Dodge Cove echoed Roth’s concerns. Chair of the board, Barry Pages, said he agrees to include Roth’s comment on air quality when they investigate advice on how the project may affect the region’s watershed.